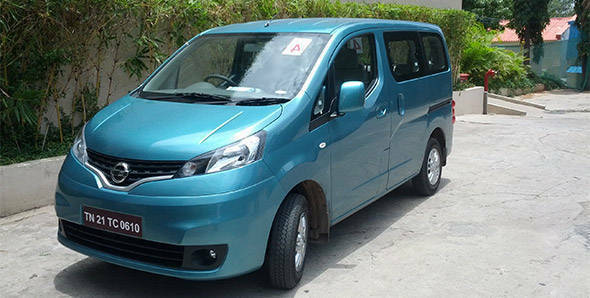 The Evalia is one of Nissan's most important product launches since it set up shop in India. This is the vehicle that they hope will finally get them the big sales figures. So what is it then? Nissan doesn't quite like the word van and has decided to call it an Urban Class Utility Vehicle. What it actually is, is an MUV that fits between the Ertiga and the Innova. At first glance it looks very imposing and is quite higher than both the Innova and the Xylo. In reality it's shorter than both at just 4.4m in length. It's also much lighter than the two thanks to a monocoque construction that tips the scales around 1.4 tonnes. It's a mixed bag in the visual department. The front end is very funky looking with smart swept back headlamps and bulging wheel arches. The side profile uses a multitude of lines and a different window arrangement to keep things interesting. However the design is a bit let down by unremarkable flat rear end with its low set Scorpio-like tail lamps. Things on the inside are simple and straightforward with a very spacious cabin that can seat between two and seven people thanks to flexible seating options. There's also quite a bit of luggage space even with the third row up. You get aircon vents and a controller for the third row but none for the middle bench. There are a few pieces of kit that shouldn't have been overlooked but have been, like a day night rear view mirror and while you get a reverse camera there's no parking sensors or an audible assist. Power comes from the very familiar K9K diesel engine that makes 85PS and 200Nm here. It's just about manageable and despite some lag you never feel that the car is exasperatingly slow. But it's not exactly what you'd call quick either. Nissan however claims a very high efficiency of 19.3kmpl, that's again significantly higher than the competition. Ride quality is supple and comfortable on most roads although the Evalia does have a tendency to crash through larger potholes. The car comes with surprisingly small 14-inch 165 section tyres for that extra efficiency but our drive showed that the car is stable at speed, brakes well and holds a line around corners. Of course this isn't the type of vehicle to push hard and the Evalia delivers as long as you are reasonable in your demands. The Evalia then offers excellent space coupled with a decent drivetrain and kit levels. It isn't an entirely revolutionary product but it could upset a whole lot of apple carts if Nissan gets the pricing right, a figure we think should be between Rs 7and 9 lakh. Pricing will be disclosed when Nissan launches the vehicle (in four variants) in September.